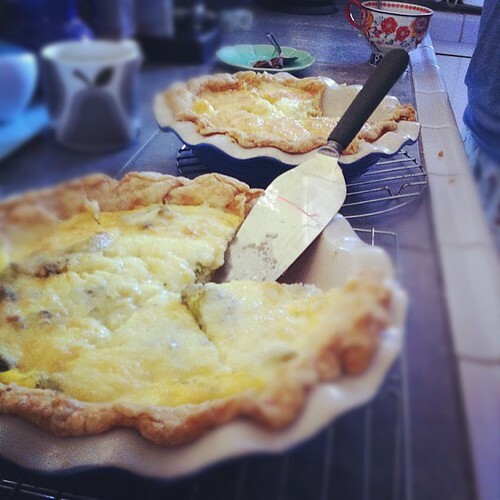 Not only does Alex bake amazing cookies, he also turns out an amazing pie crust and quiche. This morning, he treated us to one quiche made with Maine shrimp, and another made with broccoli. For the crust, the recipe he uses is adapted from a family recipe that my Dad (also a pie-guy) uses, that he got from my Aunt Roseann. Rather than use vegetable shortening, however, Alex uses a good quality butter, like Kate's. This is the best pie crust. Flaky, light, buttery, and it melts in your mouth. Pour into flour mix. Flour hands, mix with hands. Divide into two balls, let rest for 15 minutes. Then roll into crusts on a floured board. 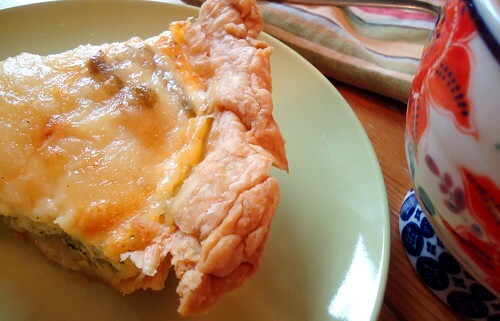 Quiche Recipe - adapted from Simply Vegetarian Crystal Clarity publishers, 1989. 1 pre-baked pie crust. Shape dough (above) into pie plate, prick bottom well with a fork or use pie weights. Bake at 400F for 5 minutes, remove from oven and cool. 1 1/2 cups grated cheese - Cheddar, Swiss, Monterey Jack, Gruyere, whatever you prefer. We like a nice sharp Cheddar. Melt butter in skillet, saute onions and garlic. Pour mixture into a baked pie shell. Top with The Secret Ingredient (below). Cover with the grated cheese. Blend eggs and cream in a medium bowl, add salt and pepper and stir well. Pour over all in pie shell. Bake for 35-45 minutes, until center is firmed up. If crust begins to get too brown, cover with foil to prevent over baking. * 1/4 lb Shitake mushrooms or 1/2 lb of other fresh mushrooms, or mushroom mix. Slice mushrooms, add to skillet just as onions are almost done, for about five minutes - don't overcook. * 1 medium head of broccoli, steamed. Or if using frozen, thaw completely, approximately 1/2 lb of broccoli. Chop into small pieces. * 1 cup of fresh or frozen (thawed) spinach.